As part of the pre-MOT checks I was doing, I was trying to track down the cause of a slow front near-side indicator. To help gain access to the wiring I thought I'd remove the fan guard, which just caused more problems. I was pretty surprised when the two bolts holding the guard on started turning without much effort. Less impressed when each of the bolt heads sheared off. The bolts run into captive nuts and a couple of investigative camera shots showed them pretty well rusted under the slam panel. I decided to drill them out, hoping that I'd be able to release them and simply replace them with new bolts. This did not go as planned as the drill came out mid-captive nut. So reusing those seemed out. Then I had the thought of just re-tapping the drilled hole as it was just slightly smaller than the replacement nut. 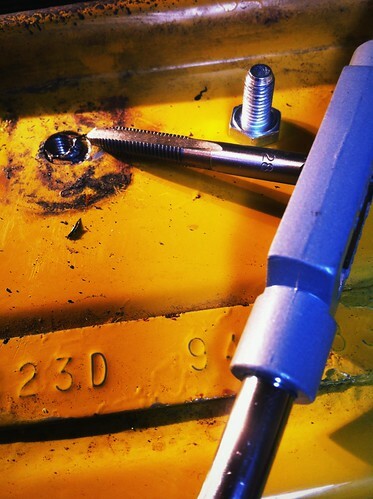 A quick trip to Machine Mart and I had the requisite tap and die kit for Imperial sized bolts.The actual process was very quick and I was soon screwing the new bolts into place. Oh, and the slow indicator turned out to be a bulb fault(! ), but now I at least know I can get that guard off easily again if I need to.